Wordless Wednesday -- aka Fun with Polyvore... Orange you glad you run? Another Saturday, another long run. 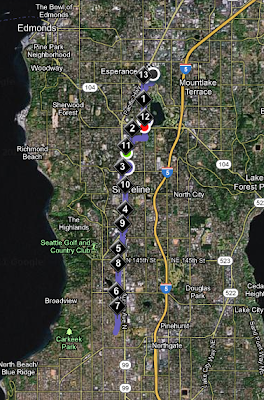 This week we decided to do an out and back on the Interurban Trail. I had mapped it out on Map My Run from the south end of the trail at 110th all the way out to what I still think of as the Kmart -- but which has been a 99 Ranch Market for at least a decade, I think. So we started on a little stretch of trail, but soon hit the first closure. It looked on the map like the trail would continue for a bit, but they're clearly in the final stages of preparing it. So we were quickly sent out to 76th, which is a blandly busy street. The sidewalks were a little too narrow to run next to each other -- especially given all of the driveway cuts. And then we were headed up the hill to 205th. We missed the light, and stood there, a little chilly, for nearly 5 minutes. But it was early in the run, and I was excited to be running somewhere new. Besides, the real trail was about to start. Well, sorta. The next stretch of trail was a hilly, windy path through the woods next to a big condo / apartment development. It was a little bit damp and the trail felt slippery, so we dropped to a walk. Not the best start. But we reached the top, crossed 76th, and ran down 200th to a real stretch of trail. This part was really nice -- a nice, wide, empty trail. We ran on the back side of Echo Lake (who knew? ), behind the big nursery, and popped out by at 185th. I think one of the things I liked best about this run is that I essentially knew where I was the entire time -- and we could track our progress as we crossed the streets. And you know how I like knowing where I am. We then ran along the very white pavement that I seem to recall was once a series of used car lots. It's been nicely parkified -- even if one wonders who exactly will sit on the benches 50 feet from Aurora. But it's nice to see grass replace pavement, I think. We followed that path for a while until we reached 175th and Top Foods. I had run out to this point, once before, on a very hot day. I knew that from here until 145th the trail was lovely, so that added some spring to my step. Speaking of spring to my step, I experimented a little on the short but steep ramps up to the overpasses at 155th. I concentrated on running lightly and quickly, rising up to my toes, as it felt as if I was flying. Now, I don't think I could continue at that pace for long, but changing my stride for the hill seemed to work wonders. Very cool. Then back along the stretch past the back side of McDonalds. True to form, it was a little weird again. Two random people just standing or sitting in the grass. That said, they probably thought we were the weird ones. Who knows. We crossed 145th and ran through the "lost" part of the trail -- sidewalks, the road in front of Suz & Eric's place (considered stopping, but we were on a mission!) -- and then found our way back to it just past 130th. This is the part of the trail that I had seen when I crossed it with my car and noticed the "flip book" signs. I wish I had taken a picture, but it turns out the artist's name is Jennifer Dixon... and that she has also been tapped to create additional work for the stretch along Linden between 145th and 128th that I was just talking about. Pretty cool. Sadly, I wasn't running anywhere near fast enough to get the "flip book" effect... but I bet on a bike it's super cool. And then we turned. And I realized that the "lack of wind" was actually a tailwind. Oops. Suddenly it was a lot harder to to run. Ha. But we continued to run in to the wind, happily ticking off the blocks and the landmarks. We got held up a couple of times by traffic lights -- a couple of minutes here, a couple of minutes there. Things went pretty okay -- even if I was a bit slower -- until we got back to 200th and run back into the woods. The trail was too slick, too uneven, and too steep for me to run. So we slowed to a walk. And then we got to 205 and just missed the light. Cue another 5-minute wait for the walk signal, and then of course we had another hill. By the time we reached the bottom of the hill, we had less than a mile to go -- but I was now cold and stiff and really struggling. We ran a little more, but I was pretty much done. When we hit 13 miles Wil started running again, and I followed. But I was more than happy when Wil grabbed my hand and we crossed the "finish line". Phew! Because we agreed that we didn't like the north end of the trail very much (too hilly for us to happily run down, I feel), we scouted the south end. 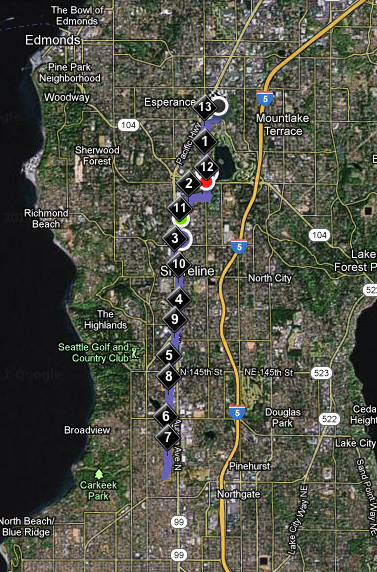 Yes, the trail ends at 110th, but we could run a bit farther on Fremont and take out the part after 200th. Easy peasy. I think I must subscribe to every daily deals site on the planet. I don't buy as many as I used to -- I learned the hard way that it's sometimes really hard to make the time to actually REDEEM the great offers. Last year I scored a Zozi deal for half off the inaugural See Jane Run Half Marathon -- so it was only $37. (I am sure that not everyone paid that -- so don't tell me that's why they had such poor race organization... ha). And I know that Active.com has actively courted race directors and encouraged them to offer deals. The rationale is that it generates buzz and serves as extra advertising for your event. So I was a little surprised that I hadn't seen similar offers for other local races. 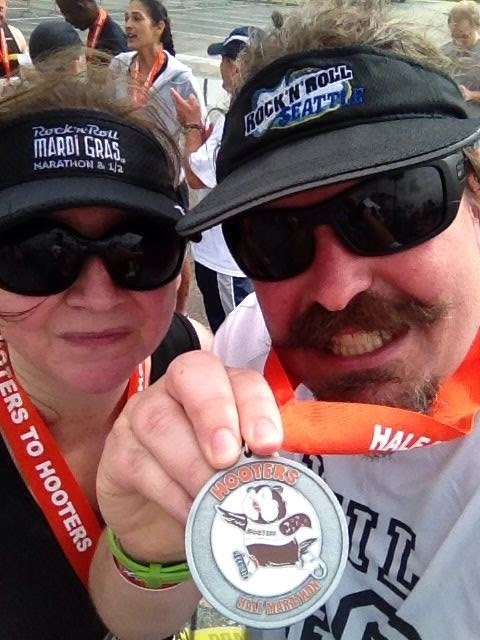 Well, okay, there were some mud runs, and a couple of 5Ks. But no big local halfs. Then in the last week I've gotten TWO deals -- a Zozi deal for the Seattle Half Marathon ($39), and a Schwaggle for the Heroes Half ($30). Of course, I snagged both of them, and we're all signed up. 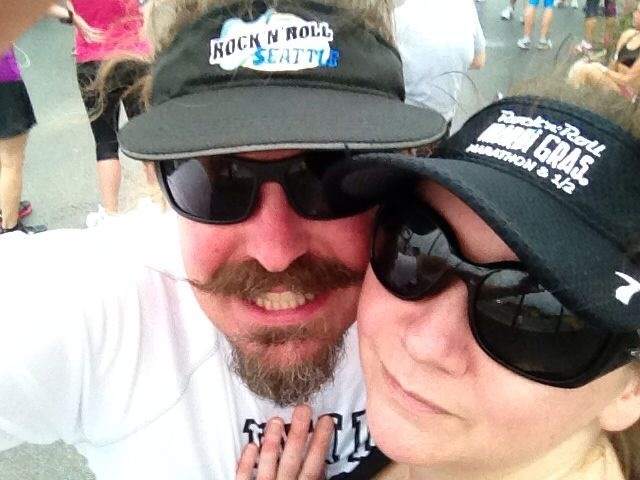 To be honest, we would have run the Seattle Half in November as part of the 40@40 project. But -- even though I had looked at the Heroes Half -- we wouldn't have signed up for it at $60 each. So the deal worked -- it got us to register. 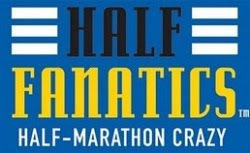 I'm especially excited about the Heroes Half. You know my love of running over bridges -- especially bridges where pedestrians aren't normally allowed. 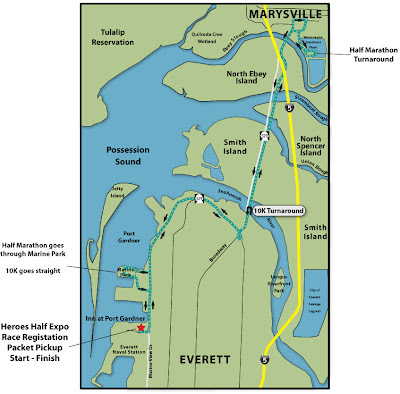 This race has FOUR bridges, and we get to run them out and back. Whee! Today most of the people on my team were at an offsite, so I decided to work from home. I took a couple of breaks, however -- one to drop my car off at Midas to have some brake work done, and the other to spend lunchtime swimming with the biddies at the Ballard Pool. I decided I wanted to try "aqua jogging". After all, I've heard a lot about runners rehabbing by running in water. I also knew it could be a very good workout. But I also figured it would probably be full of old ladies. Turns out I was right on both counts. Got to the pool, put on my "floatation belt" (too big, and slightly uncomfortable), grabbed the "weights" (which are actually foam floats), and got in the deep water. I really enjoyed the floating, the full range of motion, etc. There were a lot of ladies and a couple of gentlemen in the pool. Luckily, there was a lot of space, so I didn't let myself get too distracted by the large group of ladies who were obviously there for a social visit, paying absolutely no attention to the instructor, the workout, or anything. Within 10 minutes my legs and shoulders were burning -- very nice. And I do think I got a good workout. By the end of the song it was all I could do to keep my hands from joining in. 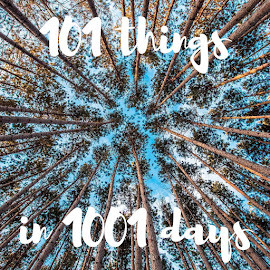 Heck, while typing up this post I found myself doing it. It's not like I was a big fan of the song, or anything, but that's all I will ever be able to associate with it again. Which is not so bad, when I think of it. Determined to keep going on this project -- so despite the cold and the wet, we headed out to Green Lake to run our 13.1 for the week. 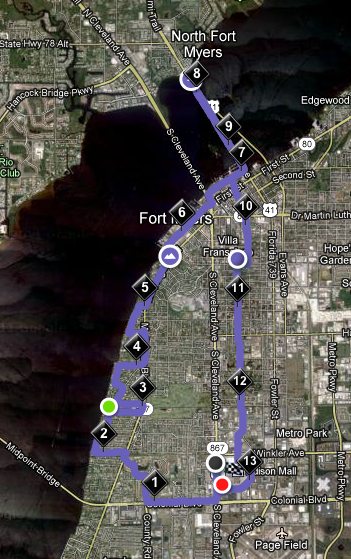 We had worked out that we would need to run a little over 4 and a half times around the lake on the inside path. 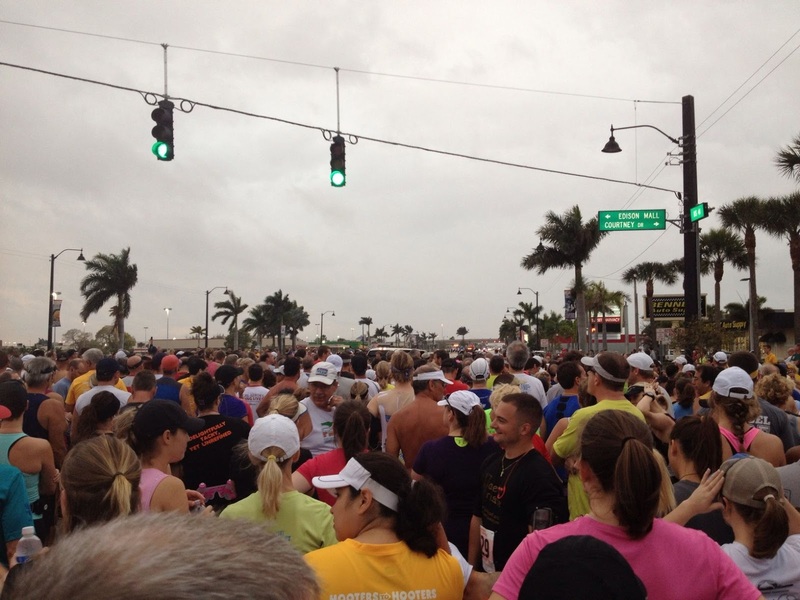 It was drizzly and gray... and I -- foolishly -- thought that running in shorts would be okay. I mean, hey, I had run in shorts in the rain for the past two weekends. So we started running -- parking by the Bathhouse because our usual spot was full of folks at the regatta -- and I got very cold, very quickly. It might have made the run easier, in a way -- I was essentially numb for a good portion of the morning. I looked down at one point and noticed that my pale legs were bright, bright red. Strange. But we ran on and on... and on. We carried water and gels, but never actually stopped to eat or drink any of it. And it got wetter, colder, and eventually started snowing. We had strong headwinds on one side, and tailwinds on the other. And around and around we went. The regatta seemed to end really early -- apparently it was called off before 11am. But that made it much easier to run past the aqua theater, at least! When we finished the fourth loop. we had just 1.9 miles to go. So we ran a mile out and turned around. That last mile was a little rough -- but I knew we were in the home stretch. We got back to the parking lot and very, very happily, we were done. It was so cold that I had a hard time unzipping the pocket with the car keys -- and we went straight home and into the shower to warm up. Total time: 2:33:35. No breaks other than a quick stop at the car to drop off a shirt. Not half bad. 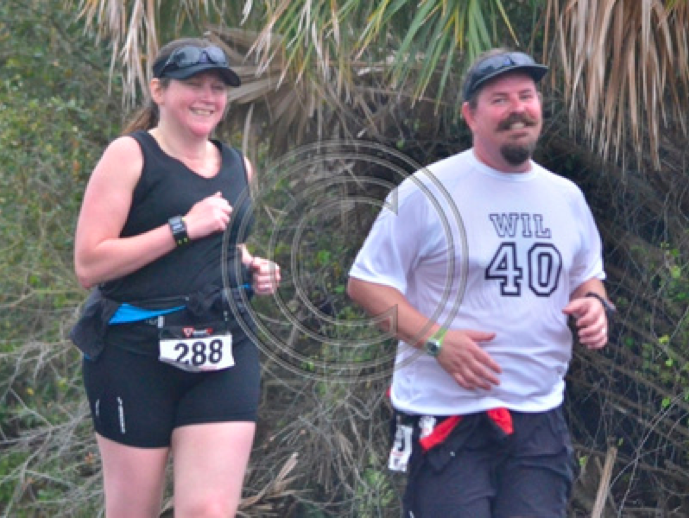 For our second race in the 40@40 project, the Swamp House Half Marathon was a perfect choice. 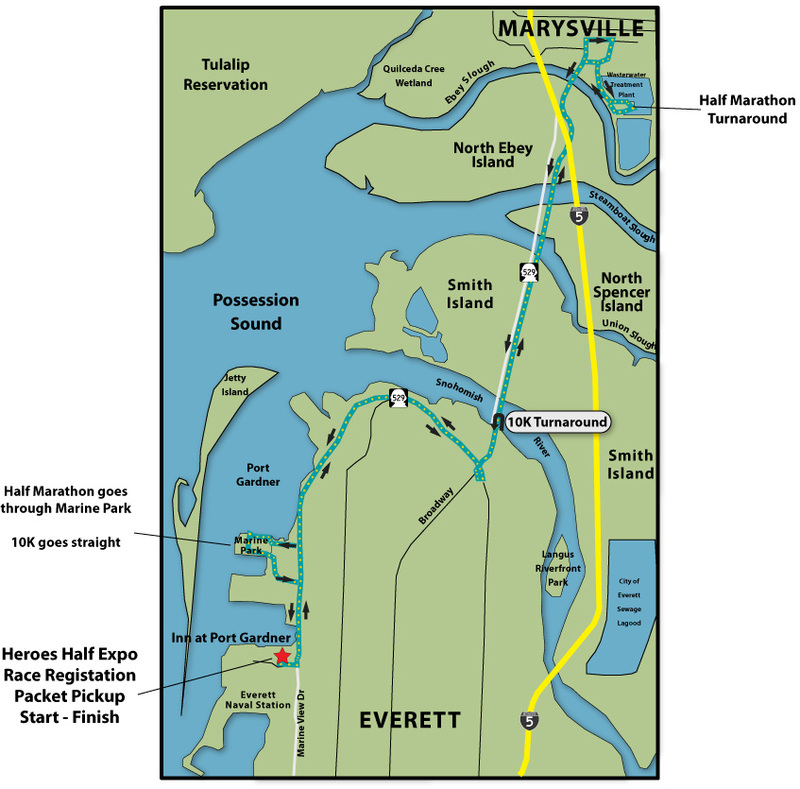 Less than an hour from our hotel, decent start and finish time, good after party, and (for the most part) a nice route. 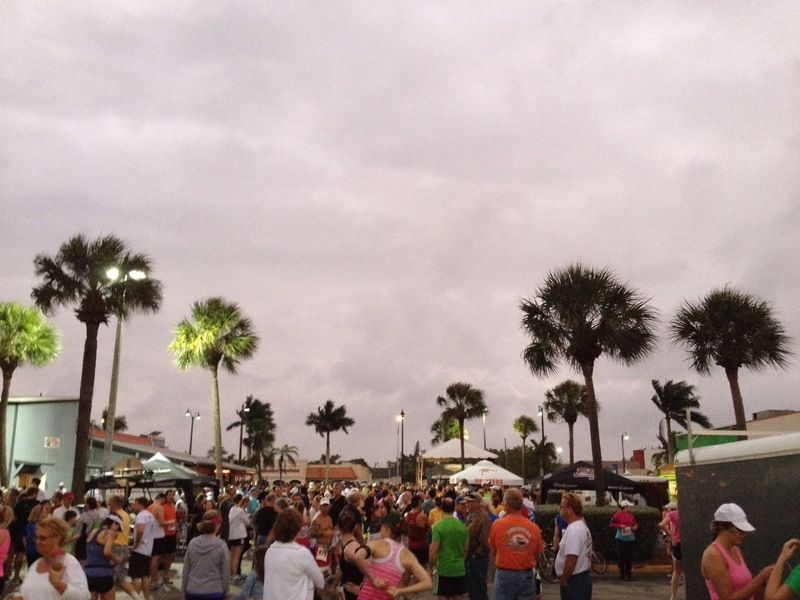 The organizers were very organized, with good, helpful emails before the race, and they secured a large parking area. We were all instructed to arrive before 6:30 when the roads would be closed for the start of the race. We got to the area easily and quickly -- and then at 5:58 joined a long line of cars stretching for over a mile on the 2-lane access road. It took us over 30 minutes to inch forward to the parking area, and we were by no means the last people in the line. Once we got to the parking area, it was clear why it was taking so long to park -- clueless runners just walking in the road. Now, really, you also drove in on that road. Didn't it occur to you that it would be faster if you got out of the traffic flow and let everyone get parked? But we got parked, picked up our shirts (white, sigh) and numbers, and headed to the start area. We had just "sprung forward" so it was very, very dark. We decided to take our jackets this time -- just in case. Plus, we'd be happy to have them before the start. We joined a line at a clump of porta-potties (the line for the plumbed bathrooms was too long to bear), chattered with the other runners a bit, fretted about whether the race had started or not, and essentially passed some time. We made our way to the starting area, not knowing if we were with 5K runners or half marathoners -- the 7am start time had passed, but that wasn't surprising given the number of cars on the road. It was too dark to take a starting line photo... really really dark in the swamps. But then, all of a sudden, the national anthem, an air horn blast, and we were off! We first ran out along the access road -- a few rolling hills, nothing major. But about midway through the race we noticed that while the race was "flat", it was rarely actually flat -- we always seemed to be going up or down a slight hill. Not that that's a bad thing, but it was sorta funny. 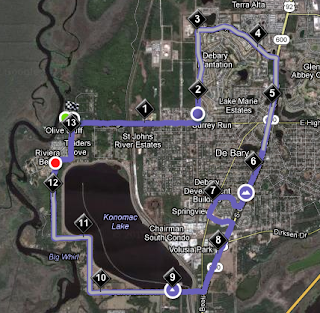 We ran through a residential area, and then joined a big 4-lane highway for a few miles. This was the least pleasant part of the course. But we amused ourselves by watching the pushup guy (every so often he would drop and do a set of pushups). Very exciting to turn off the highway around mile 8.5 -- because then we were back in an area that felt very rural. Some of the road had gorgeous, arching trees -- super pretty. For his birthday, I had made Wil a "40" shirt to wear to the races, with 40 @ 40 on the back. It attracts a lot of attention -- people asking how many he's done so far, etc. (This will be better as we get later in the year -- but the first two races we had to point out that the birthday was March 1...) So we talked a lot to our fellow runners. People were very excited and supportive. I've decided to come up with something he can pin on the back -- showing how many he's done -- but I haven't quite figured out the format yet. Work in progress! The morning was hot, and super humid. I just felt damp the whole time. Then I would feel a little surge in temperature -- extra warm -- and a few seconds later it would start to drizzle. Perhaps that's a dew point thing? Who knows. But the cycle repeated throughout the race. Warm, warmer, hot, drizzle. 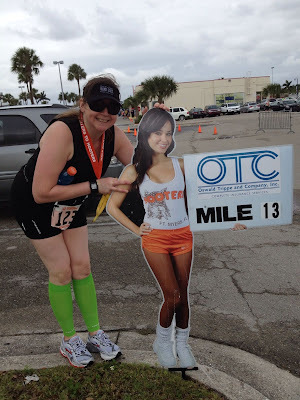 I started feeling very rough around mile 11 -- felt like I was dragging my feet and having a lot of pain in my left hip. So I needed to walk a bit, which was okay. Then, suddenly, we reached the last corner and could see the finish line. 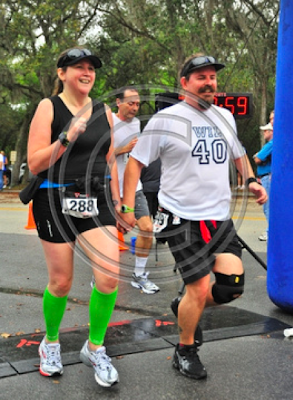 We joined hands and "sprinted" to the finish -- getting a lot of "aww, how cute!" as we approached the finish line. Yay us! We collected our super cute, bottle opener medals and made our way to the finish line party... which wasn't a super great party, sadly. The line for beer was loooooooong, so we settled for bagels and bananas. The weather wasn't the best, and I certainly didn't feel much of a "party" vibe, sadly. Perhaps it was the beer line that bummed people out? Also... isn't this place a bar? Shouldn't it have been really, really easy to serve beer quickly? One guy pulling beer isn't going to do very well for a race with 1000 people, I"m afraid... And, yes, I know that bottled beer is much more expensive than keg beer... but you did just give your runners a bottle opener medal... maybe everyone should have been offered one bottle of beer as they entered the party? post run -- he really is holding the medal, it's just so shiny!